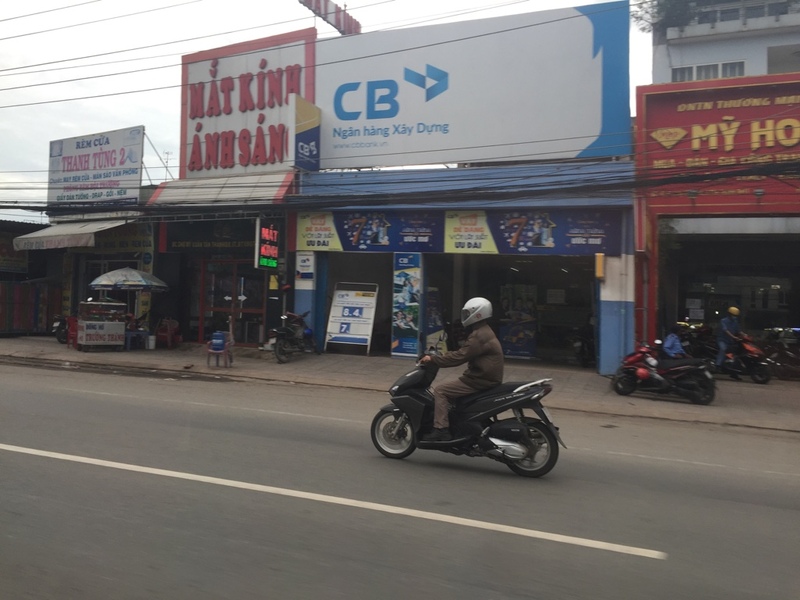 Following our pleasant intro to Vietnam in Nha Trang, we were prepared for the next travel challenge: the country’s largest city, and arguably the headline port of call for the cruise: Ho Chi Minh City (a.k.a. Saigon). Well, actually, the ship said it was docking in Phu My. Well, as with many European cities (and, as Mathew pointed out, his hometown of Sacramento), the big Asian centers typically lie on rivers just inland from the sea. That’s true of HCMC, which sits on a confluence of waterways that encompass the Mekong Delta. 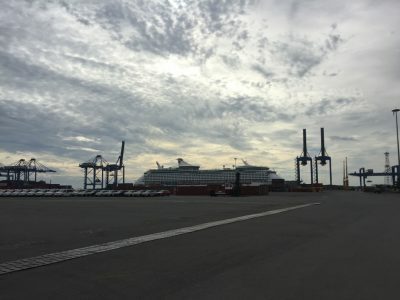 Our ship pulled up at this industrial port and only offered a bus drop off and a pick-up ten hours later—a long day of to and fro. So it was time for me to again don my independent-traveler hat, and seek out alternative transport to and fro. 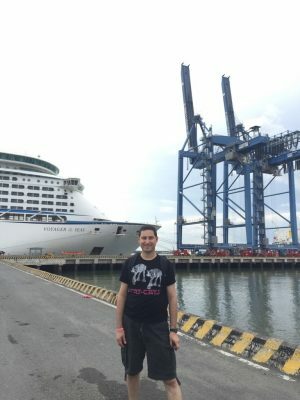 Naturally, the cruise lines made it seem impossible, insisting that “entrance to the cruise port is at least a 20-minute walk from the ship” (it was more like 7 minutes); and “Ho Chi Minh City is at least 80 miles from [the port city] Phu My” (more like 40 miles); and—of course—“taxis are very limited.” Even though we spied a dozen of these around, we’d already pre-booked what’s often a great option in this part of the world: a car and driver for the day. Okay, I was a still a bit nervous about it: I’d never before merged my indy-travel and cruise travel styles in a totally new city, let alone one of Asia’s mega-metropolises (HCMC now boasts a population of over 10 million). Luckily, at breakfast on up Deck 11, I spotted it: the entrance plaza where we were to walk to meet our driver. It was on the other side of a sprawling container port, another first for me: I’ve never before seen these giant container cranes up close and personal before; those at the Port of Oakland back home are only visible from a distance. They’re freaking massive; even if they didn’t serve as inspiration for the AT-ATs in the Star Wars films (as has been postulated, and as my shirt in the photo suggests), they’re intimidating enough on their own. Our driver, Hung, a middle-aged local who spoke a smattering of English, met us in his oh-nice-it’s-roomy Ford hatchback, right where the car company said he’d be. So far, so good. I’d already studied the route extensively, geographic obsessive that I am, and he followed it exactly. Another detail those various cruise and online guides sadly missed: in stating “there’s nothing between Phu My and central Saigon,” I’d been led to believe we’d see a whole lot of… well, nothing on the hour-plus trip. Boy, was that an inaccuracy: the four-lane quasi-highway leading from the port to the main east-west highway into the city was lined cheek-by-jowl with shops, eateries, advertising signs… picture a suburban drag back home like El Camino Real or Ventura Boulevard, only with wall-to-wall shops crammed next to each other like the world’s longest continuous strip mall. The odd gorgeously adorned Buddhist temple or bit of woodland or flooded rice paddy offered only brief respite from this mammoth strip of commerce. 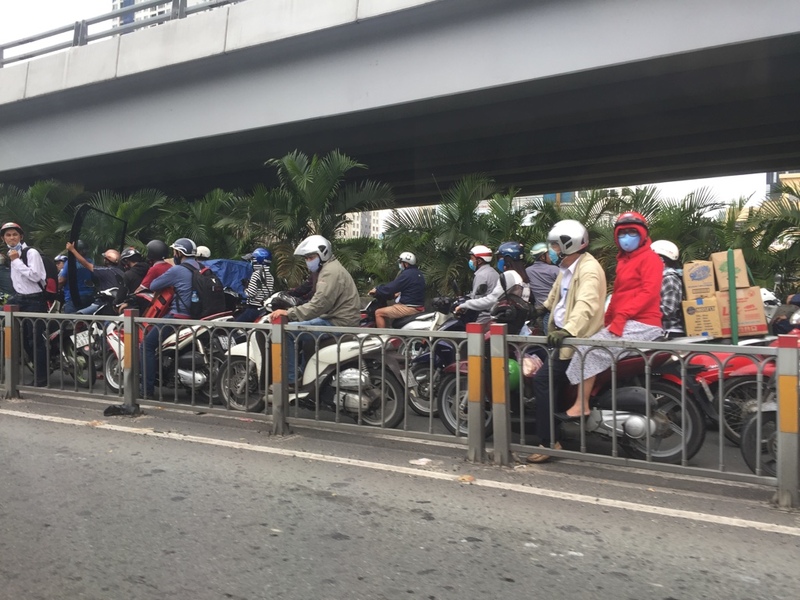 Eventually, we popped onto the freeway heading toward District 1, the central part of HCMC that locals still refer to as “Saigon.” Thickets of new and under-construction high-rises filled the view. 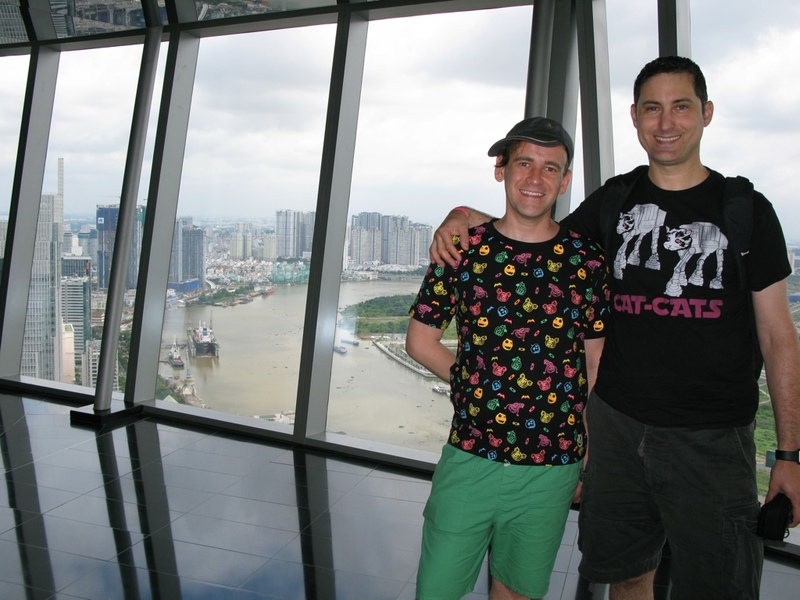 We pulled up, naturally, to Saigon’s tallest building: the Bitexco Financial Tower. But we were really here for something else I enjoy in my travels more than going up tall buildings (though we did that too): a meetup with somebody from back home on their own overseas adventure. Jake was a co-worker at my last job; his all-remote team made it possible for him to work halfway around the world, just as as Mathew and I had done a couple years back. Although he’s San Francisco born and raised, his family’s from Vietnam and he’s been having a grand old time being a digital nomad. “I feel like this city’s my second home,” he said, as we looked out at the mammoth sprawl from Bitexco’s observation deck. The building features a helipad—though they’ve had a few issues getting it functional. Still, it looks like something out of an Avengers movie. Jake’s fluency in Vietnamese facilitated our driver’s piloting to the next stop, something for which Mathew and I have become almost infamous for in our our global treks. 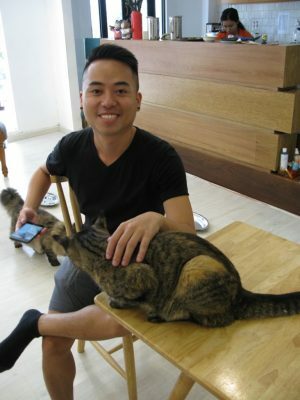 The Saigon variant of this emerging global phenomenon resembles its European or Japanese counterparts: food service in a common space, and resident cats rather than adoptables (as in feline cafés back home). This translated to a broader age mix of creatures (the adoption-based places usually have younger felines)… and an even more more blasé attitude than usual (if that’s indeed possible) from the furry denizens. Next, a bit of shopping and lunch. Arguably one of the better parts of overseas travel is checking out what clothing shops offer Over There. Sure, many complain about globalization and the presumed sameness of shopping the world over. But look closer: an H&M or Zara in Saigon isn’t the same as one in Chicago or Marseilles. As for lunch, Jake corroborated something I observed in prior travels: shopping-mall food courts can—at least in some places—be good. My bowl of Pho was super-flavorful, a nice break from the meals we’d been having on the ship. Driving through the city on our way back, I beheld it again: as in Kaohsiung and Nha Trang, scootering is the way to get around. 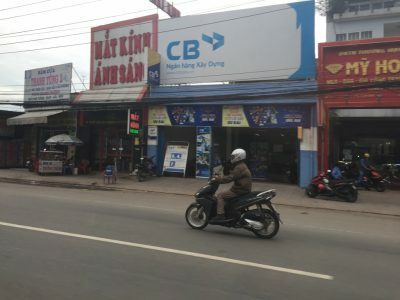 I’d heard that Vietnam has roughly one scooter for every adult of driving age, and I believed it. There are even designated lanes for two-wheelers on major boulevards and highways, though that didn’t stop one such roadway from getting jammed up from an obstruction ahead. We returned to the ship in plenty of time, leaning out our balconies for a farewell to Vietnam as we sailed out to sea. The lights of Vũng Tàu, the most seaward city on this side of the Mekong Delta, twinkled in the distance. One more day of rest and preparation, and we’d be arriving at our final destination on this Asian journey. 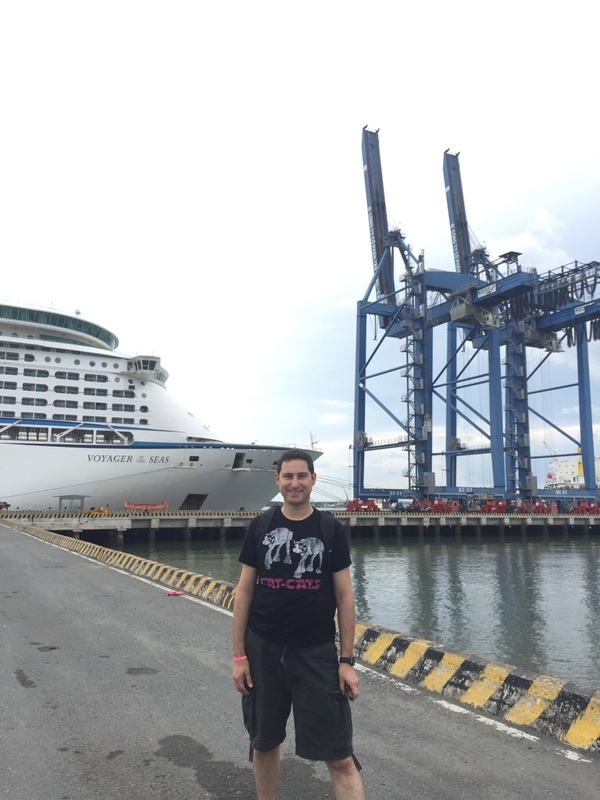 So said Mathew’s Mom as she rapped on our stateroom door the morning our ship was set to dock at its final port. This was actually a bit unusual: cruise ships typically unload passengers the morning of their arrival, and frequently arrive hours beforehand, in the wee hours. But here we were, daylight streaming through our windows, still steaming into the harbor. That’s a plus, I mused as I beheld the gleaming skyline unfolding before us. 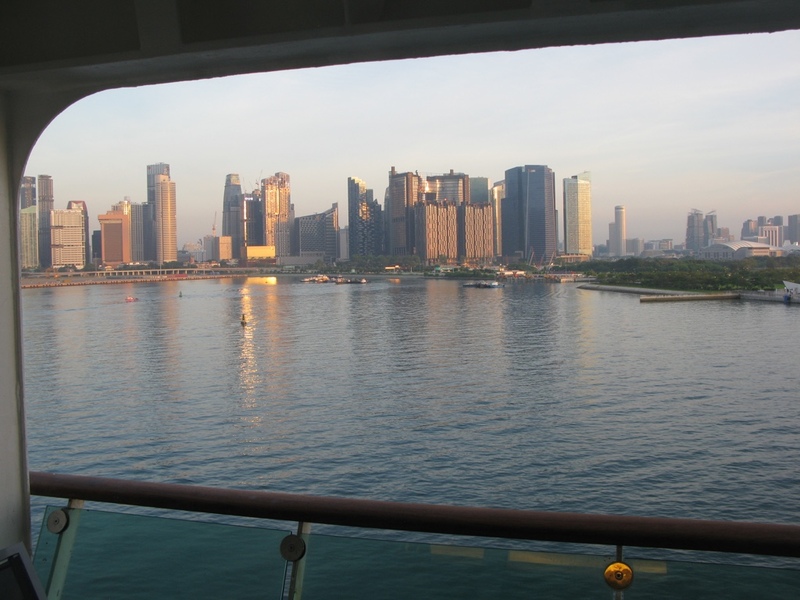 As with our departure port, I’d been to this place before: equatorial island city-state and Hong Kong doppelgänger: Singapore. As one of the Asian “economic tigers,” I’d been impressed by Singapore’s glittering skyline and immaculately-restored historic shophouses on my last visit. Well, the city center seems to have doubled in size in the near-decade since I’d been here last. I lost count of the newly built edifices as we rode a taxi from the Marina Bay cruise terminal (itself about as nicely appointed as Hong Kong’s) to our hotel. The Oasia Hotel itself, meanwhile, looked like something out of a utopian sci-fi tale: shaped a bit like San Francisco’s Salesforce Tower with its tapered top, but with chunks taken out of the building to allow for greenery, ventilation, and rooftop lounges and pools. 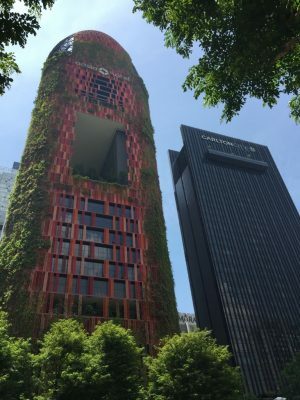 The entire building is draped with ivy for environmental effect. “It’s the nicest hotel I’ve ever stayed at,” Mathew exclaimed, as we relaxed in one of the poolside cabanas beside a long infinity pool. I’ve become something of a swimming fussbudget in my old age, but this spot, perched on the building’s outdoor atrium on the 21st floor, got me to don my trunks and throw down a few laps. As if our outrageous fortune in coming to Hong Kong and Taiwan over national holidays wasn’t enough, we had it happen again here in Singapore: the Hindu festival of Diwali fell the same day our ship docked. Worse, Mathew and I had a hankering for Indian fare and decided to head to Little India for it. Well, it was festive and crowded and crazy… and in spite of having made an online reservation (which never got received) our chosen eatery still had us wait for a few minutes for a table. The dinner we had absolutely made it worthwhile, however: a bit spicier than we were used to, but delectable nonetheless. 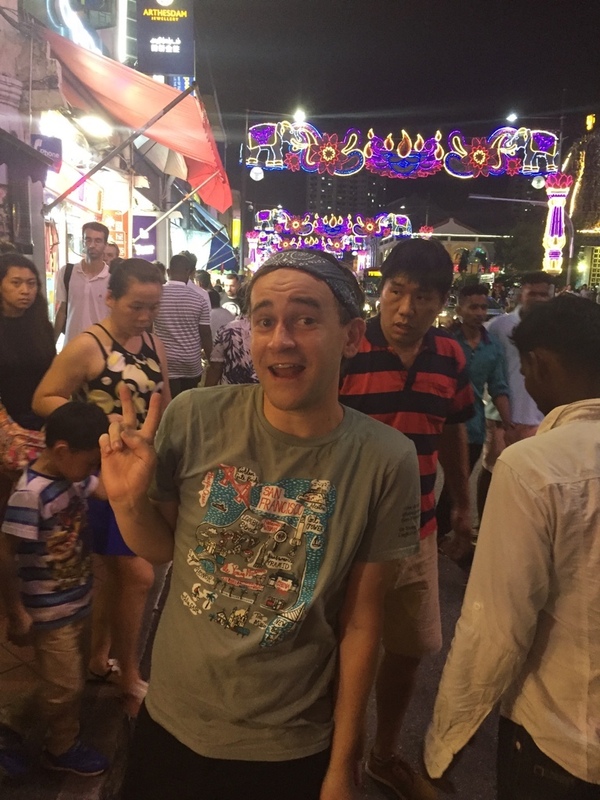 Had we been in Singapore for a few days, this holiday might have given us a total charge. Sadly, coming at the end of a long cruise and an even longer holiday, we weren’t much in the mood for crowds and festivities. We attempted to visit the famed Supertree Grove, an attraction that had opened since my last time here, but gave up in the midst of all the throngs and traffic. Instead, we called it an early night in preparation for our almost 24 hours of continuous travel to cross the Pacific and head home. One final stop on the way back to something I didn’t hit up last time I was here: major Asian airports are renowned for the fabulous amenities. 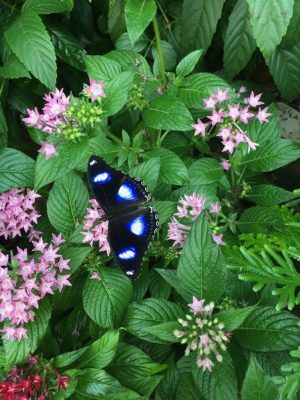 Singapore’s Changi offers something truly unique, however: a butterfly garden. Sitting in Terminal 3 serenely astride the jumbo jets, it definitely makes for a relaxing airport experience. Two long but comfortable flights later, and we were back, halfway across the world to our pets and our still-under-construction house. Life changes may have altered matters somewhat, but it won’t keep Mathew and me from continuing to wander the global rainbow.